Being an general is a tough job, especially if all you've got to control the battle is a D-Pad and three buttons. 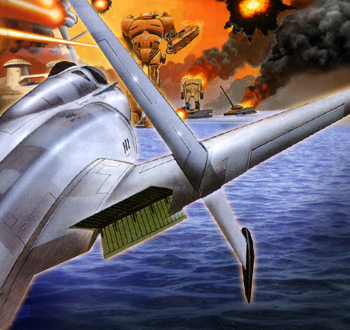 Dune 2 might be the template that the RTS genre is based on, but it wasn't the first game to give the genre a whirl. Back in the very early nineties, a console game with the challenging name of Herzog Zwei delighted fans with its tactical play. In Issue 290 of The Escapist, Steve Butts talks about how he's kept his Genesis for twenty years, just to play that one, unique game. Players took control of a huge red or blue mech, which could transform between a super fast jet and a rifle-toting robot. As a jet, you could pick up units to change their orders; as a robot you could engage in direct combat with the enemy's ground forces. Your mech was in charge of a military base where you could buy and resupply units. On the other side of the map was a rival mech in charge of its own base ... In between the two red and blue bases were a number of neutral bases. As you took them over, you gained more money to spend on new units to send against your enemy, and additional forward bases that your mech could use to purchase and resupply your forces. This, to me, is still one of the game's most arresting and, sadly, least imitated features. This wasn't Age of Empires where you were a god-like manipulator sitting above the action, directing units with a simple click of your mouse. No, in Herzog Zwei you were your avatar and you could only interact with the rest of the world through this one unit. If your infantry needed to be carried across a river of lava, you had to fly them across one-by-one. If a tank had run out of ammunition or fuel on its way to fight the enemy, you had to pick it up and bring it back to a friendly base for resupply. If a self-propelled anti-air gun needed to move its patrol route to intercept the enemy mech's own supply runs, you had to physically pick up the AA gun and change its orders. This meant your mech's location on the battlefield was critical. Herzog Zwei might not have been a great hit, but for one gamer it remains a treasured classic, even decades later. You can read more about it in Butts' article, "16-Bit Generals."